Xotics SWEET JAMILA SHEA GLAZE BUTTER for hair & skin 4oz. 100% Pure Black Badger Hair Shaving Brush for Men's For All Skin Types. Simpson M6 Horn Handle, 24mm Manchurian Badger Shave Brush, LE, Very Rare! The 24mm Manchurian badger knot is set in a very nice horn handle. Handle length is 2" and the knot loft is 46mm. Excellent condition. The Vie-Long 4312 Handmade Barber Shaving brush with Extra Brown Horse Hair is a great looking brush with classic styling. A beautiful professional looking brush. Hand Made in Spain. The brush bristles should be wet (not soaking) before use. MANICO IN ONICE. PENNELLO DI PURO TASSO ZENITH. Ein Rasierpinsel aus Kunststoff in klassischer Rasierpinsel-Form, bestückt mit handgefertigtem Pinselkopf in Dachshaar-Qualität Graudachs. Hochwertiger Rasierpinsel von Hans Baier Germany. Die Grifffarbe ist havanna, der Klassiker für Rasierpinsel. Enjoy a traditional wet shave experience with this pure badger shaving brush. Perfect for beginners, but can be used and enjoyed by all, the pure hair bristles help to work up a rich lather with shaving cream and water, so you can enjoy a comfortable shave. 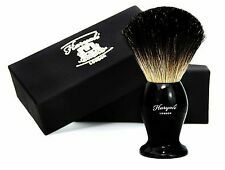 Superior Kent Quality BLK2 traditional badger bristle Shaving brush. Sealed in it's gift box. These brushes need no introduction. G B Kent have been making brushes since 1777! Die unterteilte Rasierschale eignet sich perfekt für die stilvolle Nassrasur. In weit über 100 Arbeitsschritten wird die Rasierschale in Handarbeit seit 1929 in einer kleinen deutschen Manufaktur gefertigt. Rasierpinsel DDR Ex - MÜHLE Erzgebirge GROSS Ostalgie RAR unbenutzt !! Hier sehen Sie ein alten aber unbenutzten Rasierpinsel (Profi Serie) aus der industriellen Fertigung der DDR aus dem Jahr 1975 Also schon 38 Jahre alt! produziert im ehemaligen VEB Bürstenwerk Schönheide (ERZGEBIRGISCHE PINSELFABRIK, Made in GDR). Ein Rasierpinsel aus Kunststoff in klassischer Rasierpinsel-Form, bestückt mit handgefertigtem Pinselkopf in Dachshaar-Qualität Graudachs. Rasierpinsel Dachshaar mit passender Halterung. Es gibt Rasierpinsel mit Schweineborste und Dachshaar. 28MM Yaqi Big Size handle Tuxedo Hair Knot Shaving Brush. Yaqi Tuxedo R151111 S1 28 - YouTube. Everyone will have there own individual pattern structure. Paste link into a browser window:[isdntekvideo]. Yaqi Monster Barber Pole Color Shaving Brush R1734. Paste link into a browser window:[isdntekvideo]. They are only available from Executive Shaving. Each bowl is unique, expect slight variations in size and colour. No matter which bowl you get it will be different from any other. We asked Stef to make the bottom of the bowls ridged internally so the user can generate a shaving lather easily. Everyone will have there own individual pattern structure. Lift hair and open up pores on your face, naturally exfoliates your skin. 24MM Yaqi Mysterious Space Color handle Silvertip Badger Fan Knot Shaving Brush. About hair shedding : for natural animal hair shaving brush, as it is protein substance, which is as human hair, so during use, it may have relatively more hair shedding than synthetic hair ones. Yaqi New Barber Pole Style 24mm Tuxedo Synthetic Knot Shaving Brush. Lift hair and open up pores on your face, naturally exfoliates your skin. The Maggard line of Synthetic Shaving brushes are sure to be a favorite among beginners and veterans alike. Handle Waist - 24mm (Handle at narrowest point). Handle Height - 66mm. BADGER SILVER TIP HAIR SHAVING BRUSH. Silver tip badger hair. Overall brush height 10 cm or 3.75". Dependson serviceyou select. T&C Applies. knot size 22 mm. Hochwertiger Rasierpinsel von Hans Baier Germany. Bei guter Pflege zeichnen sich Rasierpinsel aus echtem Dachshaar besonders durch lange Haltbarkeit aus. Es gibt Rasierpinsel mit Schweineborste und Dachshaar. The Vie-Long 4212 Handmade Barber Shaving brush with Extra Black Horse Hair is a great looking brush with classic styling. A beautiful professional looking brush. Hand Made in Spain. The brush bristles should be wet (not soaking) before use. SILVER TIP BADGER HAIR. Badger Hair length = 50mm. The finest natural hair for handcrafted shaving brushes. Specifically designed stand for brush. It's also suitable for many of other brushes. 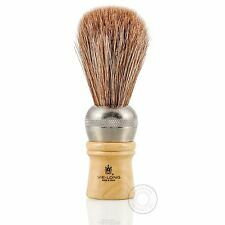 Pre de Provence Boar Bristle Shave Brush with Aluminum Handle by Pre de Provence. Pre de Provence. Product Details. Get Started: Apply shaving gel on your wet face and work up a good lather with the ZEVA Bristle Hair Shave Brush, Shave the area with the shaving machine or Razor and Rinse thoroughly with warm water and wipe with a clean dry towel. Safety razor and 5 extra blades. Arko soap and 20 styptic (stop bleeding) matches. This brush has a large and dense 28 mm Boar Knot attached to it. Loft is set at only 57mm. Effective loft is 48-52mm from the glue bump. T his makes this brush a great face latherer without the flop. Pure shesham natural Wood Stand for safety razor with a beautiful walnut finish Proper brush drying while. Sword Edge Thirsk Wood Stand for Safety Razor. displaying your razor and brush. 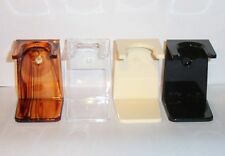 It is designed for standard size (20-21 mm) shaving brushes Groove on top. Yaqi Evil Zebra R1717. Nylon brush hair is quick-drying and not easy to fall out. High quality, can give you a superb shaving experience. How- A must have for a close comfortable shave Densely filled brush head An excellent value at this price To Care For Your Brush 1. The Vie-Long 14092 Mixed Badger and Horse Hair Shaving brush is a great looking brush with classic styling. It features an injected plastic handle, with a creamy coffee coloured barrel. Hand Made in Spain. TRAVEL - Viaggi pennello da barba da Mühle, con Silvertip FIBRE®, maniglia in alluminio materiale Pennello da barba con Silvertip FIBRE® Formato dell'anello M: 21 mm Maniglie in alluminio Peso: 41 g La testina - Silvertip FIBRE® Le fibre sintetiche di alta qualità, rappresentano una prima mondiale di nostra invenzione. Rasierpinsel aus Spritzguss-Kunststoff in Hornfarben in klassischer Rasierpinsel-Form, bestückt mit handgefertigtem Pinselkopf in Dachshaar-Qualität Silberspitz. Hochwertiger Rasierpinsel. Es gibt Rasierpinsel mit Schweineborste und Dachshaar. 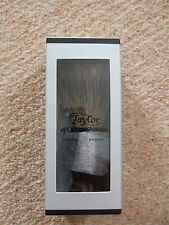 Silver tip badger hair shaving Brush. HANDLE HEIGHT: 50mm. 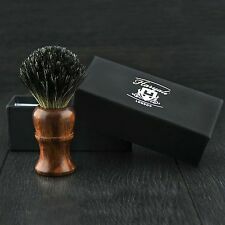 24MM Yaqi Naples Tuxedo Hair Knot Shaving Brush. Lift hair and open up pores on your face, naturally exfoliates your skin. 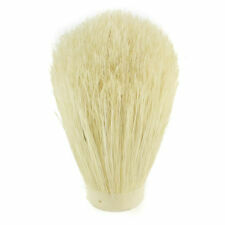 These excellent quality for money Brushes are made from hair of Badger,set in Wooden (light weight) Handle. Shaving Brush. Note This Brush handle is wooden which is natural product all brush wood color and texture may slightly change with each other.